Venture into the mysterious Barataria-Terrebonne Estuary on a thrilling airboat manned by a captain with a deep understanding of these beautiful cypress swamps and the creatures who call it home. 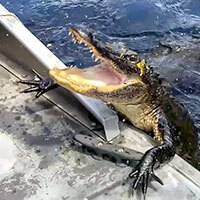 Here’s your chance to explore land teeming with wild alligators, turtles, wild boar, snakes and other native wildlife. Your guide will both educate and entertain you with stories of Cajun culture. Coupon Available. Coupon Available! 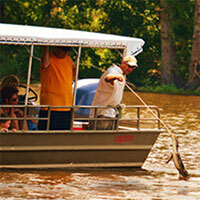 Journey by boat, Cajun-style, for a 1 hour 45-minute tour through the heart of Southern Louisiana's swamplands. 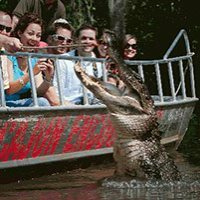 Experience real-life adventure for the whole family from the comfort of Jean Lafitte swamp boats. Tour their privately owned meandering bayous and take a look into the past. You'll see moss-draped cypress trees, fascinating plant life and the creatures who make their homes here. Coupon Available! 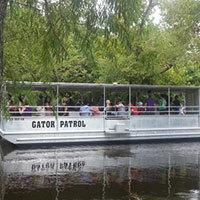 The Cajun Encounters swamp tour through Honey Island Swamp is owned and operated by New Orleans natives with a vast knowledge of the swamp and the wildlife, Each tour will weave your family through the back bayous in a 22-passenger boat for a real Cajun experience, giving you a realistic and closeup view of Louisiana swamps and wildlife. 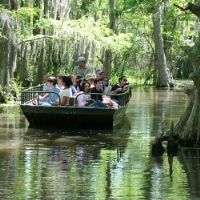 Take your family on an exploration the back country of Louisiana with Cajun Pride Swamp Tours where you’ll experience the historic Manchac Swamp. 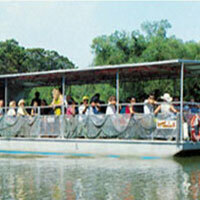 Drift through the wetlands on a boat that creatures see daily and recognize as part of their habitat. You’ll learn about the wetlands and its wildlife, in particularly the habits of American Alligator. Coupon Available! The kids will love a tour through Honey Island Swamp! The guides, who live on the swamp, are very knowledgeable and will take you and your family into the swamp to see all kinds of wildlife. They even know the names of the alligators! Take the time on your next visit to New Orleans to enjoy the beautiful and peaceful surroundings of this nature preserve. It's only 40 minutes from downtown New Orleans. (Reservations are required). Coupon Available! When you journey into the Honey Island Swamp with Pearl River Eco Tours, they take you on a journey through majestic cypress trees and winding bayous. You’ll witness unique Louisiana plant and wildlife you won’t forget in what’s been described as Louisiana’s version of the Grand Canyon. Coupon Available! 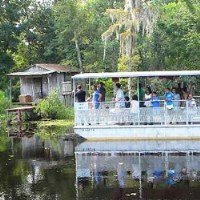 Discover how seafood from the bayou provides an assortment of delicious local dishes when you enjoy a Swamp and Bayou Tour by Grey Line. Your family will also observe nesting grounds of local wildlife including snakes, alligators, raccoons, and more. You’ll enjoy every moment with this tour that has been featured on Showtime, Entertainment Tonight, and Fox Sports. Coupon Available!